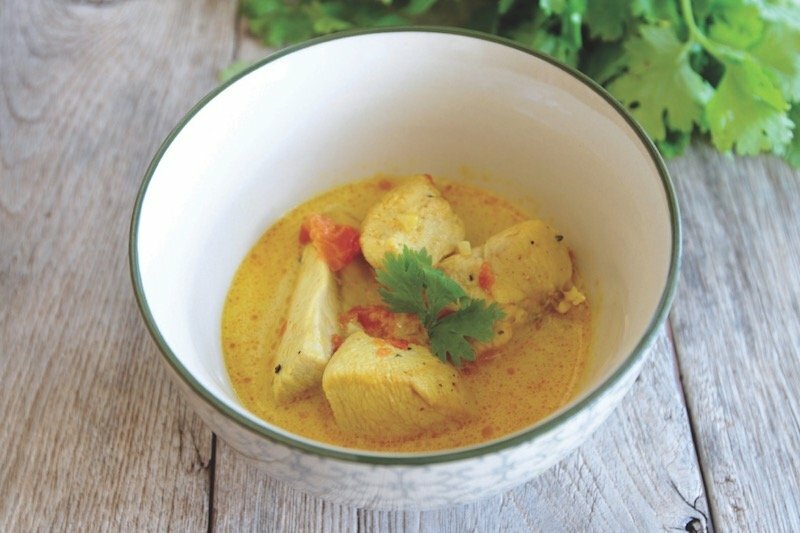 The award winning blog, Kensington Mums did a lovely feature on my coconut chicken which you can also find in my book Pure Goodness. We love the sound of this recipe and when you look at the method below you would wonder why you never tried it before., It makes the perfect combination for a family dinner that everyone will enjoy. Today’s recipe by Tanja Ting who is a former international model, chef and goldsmith originally from Denmark and famous for gracing the pages of high-end publications such as Italian Vogue and Elle Magazine. She now lives in the San Rafael countryside of rural Ibiza with her husband and two children. Cut the chicken into big bites and marinade them in lemon juice, chilli and salt. Place them in a pan with a bit of olive oil and cook on medium heat for about 5 minutes and set aside. In a pan fry the garlic for a few seconds. Then add tomatoes, turmeric, salt and cook for another few minutes. Then stir in the coconut milk and keep stirring until it starts to boil. Then add the chicken and let it simmer for 10 minutes. Serve with brown rice or quinoa and fresh cilantro on top. We tried this over the weekend and loved it! Thank you, I am glad that you liked it!